MacQuarie: Macquarie's is an Australian investment bank involved in various business sectors. 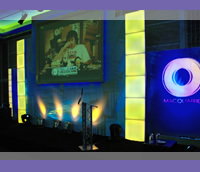 Throughout 2010 we provided sound, video & lighting for a number of staff events and conferences. The striking sets were designed and installed by Image Innovations to whom we subcontract on this project. Ashburnham Place: During the summer Ashburnham Place becomes the venue for various Bible weeks. We have provided hardware to these over a number of years, including sound and video in venues ranging from the 2,000 capacity main marquee, to youth & café venues holding a few hundred, and small seminars. 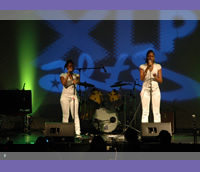 XLP: XLP works with young people in London schools and we have worked with them over many years. We provide sound & video for the Arts Showcase final held at the Mermaid Theatre, and have also toured with them on both the Fighting Chance and Guns Down tours, providing sound & video. Awards ceremonies: We provide sound lighting and video for assorted conferences and awards ceremonies. This picture of the Femtocells World Summit shows the Monkton Coombe Big Band at a gala dinner in the Sheraton Skyline Hotel, London. We provided all sound, lighting, video & set. 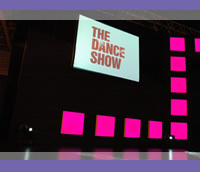 The Dance Show: November 2010 saw the first ever Dance Show at the NEC Birmingham. 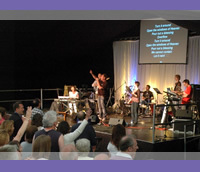 We provided a 9kw Martin Audio sound rig for the main stage and large screen video projection. Lighting was provided by Richard Horley of RMA, with whom we work closely on larger projects such as this. Musical Jamboree: This was a smaller outdoor event put on by a local church. 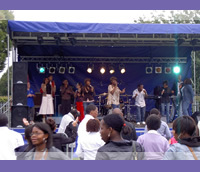 We provided a stage with sound, lighting & generator for the day long event attended by about 1,500 people in a local park. We also provided some assistance with their application for a temporary event licence and risk assessments. We have a range of good quality and affordable sound, lighting & video equipment available for hire. The equipment we hold is suitable for a variety of events, and is usually hired along with an engineer to set-up and run the equipment. We are conveniently located in the Midlands but can also supply further afield if required. Please phone or email for a quote. We have sound systems suitable for anything from a small seminar room to a large theatre, or even outdoors. Whether you need a large system for a concert or just a simple system with a radio microphone for a presentation, we have systems to suit. We have a range of projectors available, suitable for smaller meetings or larger conferences. We can provide stand-alone data projectors, conference switching systems, LCD monitors, DVD Playback, and laptop computers for PowerPoint etc. We can also provide live relay facilities if required. 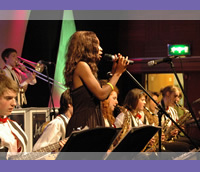 We have stage lighting suitable for concerts, conferences & theatre productions. We can provide systems from a basic two stand systems to larger truss supported systems. Whatever the resources and size of the event, Mike has always provided excellent results which have enabled these events to be a great success.